In a series of press releases beginning on Saturday, April 21, Seattle Out and Proud (SOAP), organizers of the Seattle Pride Parade and Festival in 2006, announced plans to cancel their events and declare bankruptcy. On Tuesday, April 24, the group changed course and, in a very surprising change of direction, announced that they will move ahead to organize a parade along Fourth Avenue on Sunday, June 24, but, unlike in many years past, no festival will be held at the end of the proposed parade. Troy Campbell, a SOAP board member and current media spokesperson, said the group did an about-face after having a closed-door meeting of the board on Tuesday evening in Seattle's Belltown neighborhood. "The board had not met [about declaring bankruptcy] and there were still options available. Those needed to be discussed," he said. "We needed to collectively meet. The press release that went out earlier was done prematurely." Organizers of the Seattle Pride parade and festival said they are disbanding and filing for bankruptcy. Seattle Out and Proud, the volunteer group that puts on the celebration for the lesbian, gay, bisexual and transgender community, owes the city $102,000 for the 2006 event at Seattle Center. "It's unfortunate but we are a supportive group of people that want the best for our community and hope now that someone will step up and take the events to the next level," said Weston Sprigg, vice president of Seattle Out and Proud. He said the group is meeting with bankruptcy attorneys. FOR IMMEDIATE RELEASE Monday, April 23, 2007 Seattle – In 2006, the Seattle Pride March and Festival moved from Capitol Hill to Downtown Seattle and the Seattle Center. Event attendees, organizers and city officials all hailed the events as great successes. Unfortunately, the increased scale of both the March and Festival produced poor financial results including the well publicized and still unpaid debts. The move created a lot of controversy and a competing event was produced that divided sponsorship opportunities and divided the community. Simply put, the income from both events was not adequate to cover the costs of the March and Festival. In 2007 Pride organizers Seattle Out and Proud (SOaP) voted in new leadership and SOaP’s primary concern was to produce a financially sound March and Festival in 2007. This week, after months of intense research and negotiation, it has been concluded that producing a Pride Event at Seattle Center is not financially prudent at this time. While most people believe that the 2006 March and Festival in Downtown Seattle showcased the LGBT Community extremely well, a fiscally responsible 2007 March and Festival, no matter their physical location, is the most important goal. With all of the baggage that has built up over the last year, the SOaP board has decided the best thing for the community and the future of Seattle Pride is for SOaP to step down from producing the Seattle Pride Parade and Festival, and allow someone else to step in and take over Seattle Pride. We have honestly tried to do our best as a volunteer board with no agenda other than to produce a great celebration for our community. We hope that whoever does step in can unite the community behind them and likewise lead with no alternative agenda. We look forward to supporting whichever group of people can step up. We must agree that as a community we must cut our losses and start anew. We must keep moving forward with energy, strength, unity and passion. The SOaP Board of Directors will be meeting tonight to start working out the details. This press release is being sent out as heads-up and courtesy to the community. A formal press release will follow in the near future. No further information or interviews will be granted until after our Board meets tonight. Several credible sources, who asked not to be identified, have told the Seattle Gay News on Friday that Independent Event Solutions (IES) has pulled out as the event production company for the Seattle Pride Parade and Festival on Sunday, June 24. An agreement with the Seattle Center regarding SOAP’s $100,026.33 past due debt from 2006 required that SOAP pay $50,000 in immediate debt service and hire an event production company. IES had originally agreed to put up the $50,000. Without IES, according to the sources, the Seattle Center is unlikely to proceed with a final contract with SOAP to use the Seattle Center for their event. John Merner, Seattle Center’s Director of Productions, would not confirm or deny our sources. He also said that the Seattle Center had extensive conversations with all the parties and would issue a more factual statement early next week. Several calls and an e-mail to Dave Meinert, co-owner of IES, went unreturned on Friday. The Seattle LGBT Community Center has called an “emergency session” of their board to discuss a “situation” with Seattle Out And Proud and what the LGBT Community Center might do if the Sunday event collapsed, according to an e-mail on Friday afternoon from Executive Director Shannon Thomas to a planning committee for Pride events on Saturday. We have potential to make some significant change with Seattle's pride festival, and the board needs to ratify any next steps and responses. Per their lead, I'm in a brief holding pattern with QueerFest until they decide how to proceed with this potential opportunity for The Center and our greater community. Klaxons CD-release party at Manray tonight - Win tickets, CDs! Seattle Gay News joins Geffen Records and Manray Video Bar for a Klaxons CD-release party tonight at Manray (514 East Pine). Tickets to see Klaxons live at The Crocodile Cafe on April 23 will be given away tonight, plus CDs, posters, and other delicious goodies. We'll also play selections from the English trio's debut album Myths of the Near Future. The special event is part of this week's "Alternative Tuesdays" club night, a weekly offering co-sponsored by Seattle Gay News and Manray Video Bar. There is never a cover at Manray. 21+ welcome. Come watch music videos tonight by Radiohead, Snow Patrol, We Are Scientists, Ladytron, Beck, The Strokes, The Killers, and other alternative music favorites, and mingle with other gay-gay friendly alt music fans. The newest band on the hot rock block is Silversun Pickups. The SoCal-based quartet is wrapping up a two-month tour with Grammy-nominated group Snow Patrol and Grammy winners OK Go. They've recently broken into Billboard's Top Ten Modern Rock Tracks chart with the single "Lazy Eye". Before they head to the Coachella Festival, where they'll share the stage with Bjork and Arctic Monkeys, Silversun Pickups spoke to Seattle Gay News. Drummer Christopher Guanlao phoned us directly from a parking lot in St. Louis last week, after a festive night of partying. 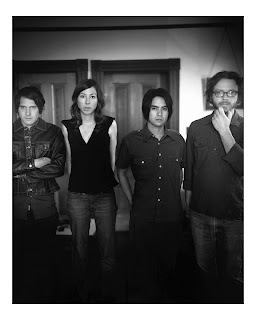 In December, Seattle Gay News selected Silversun Pickups' "Well Thought Out Twinkles" as the Best Single/Track of 2006 and the unit's full-length release, Carnavas, amongst its list of the year's top ten albums/CDs. Watch the cool music video for "Lazy Eye" by Silversun Pickups here: http://youtube.com/watch?v=bg68lDaisig&mode=related&search. Named one of "Eight Artists to Watch For in 2007" by Seattle Gay News, we're extremely pleased to feature an interview with Christopher Guanlao of Silversun Pickups in "The Music Lounge" this Friday, April 13, the exact night the star-bound ensemble plays a sold out show at Neumos (on Capitol Hill). Grab a copy of the Seattle Gay News on Friday and get familiar with Silversun Pickups. And, pick up a copy of the band's electrifying debut Carnavas at Easy Street Records or a favorite record store near you.